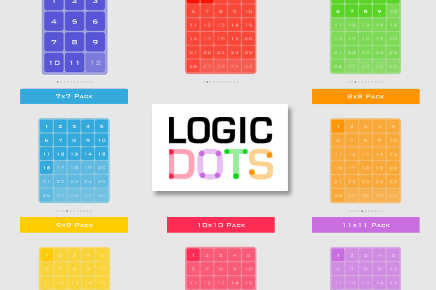 If you like solving ingenious puzzles, you need Logic Dots. 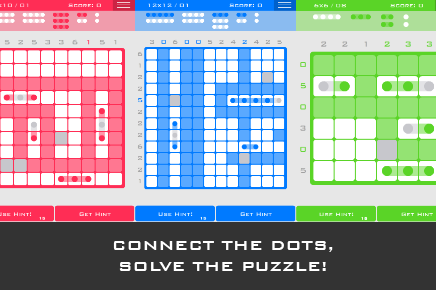 It’s easy to play – place dots on the grid and solve the puzzle! 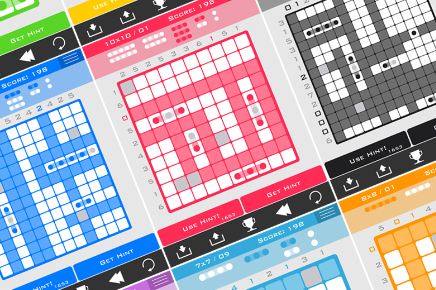 Beautifully simple, unavoidably addictive and devilishly difficult as you progress; Logic Dots is a uniquely fantastic combination of Sudoku and Battleship. Each brain-twisting Logic Dots puzzle consists of a blank grid surrounded by numbers. Players need to find hidden dot shapes on the grid, making sure each row and column contains the required number of dots. There are no time limits or move limits, and hints are freely given in some puzzles to make them easier on players. Beware though – as the game progresses, deduction challenges become increasingly devilish. Only true ‘Masters of Logic’ will make it to the end! 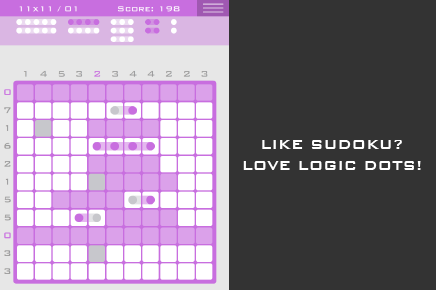 – USE LOGIC TO WIN: Place dots in the grid to create dot shapes and solve each logic puzzle. – BEAUTIFUL PRESENTATION: Gorgeous, colorful levels are a treat for your eyes. Logic Dots is color-blind friendly as well! – INCREASE YOUR INTELLIGENCE: Logic Dots sharpens logic deduction and improves cognitive skills in players. – NO PRESSURE, TAKE YOUR TIME: There’s no time limit and no move limit. Take as many goes and as much time as you want to complete each puzzle! – RENOWNED DEVELOPER: Logic Dots is made by the lead programmer of hit puzzle game, Tiny Thief! – UNRIVALLED DEPTH: Over 250 unique and increasingly complex brain-teasers provide many hours of intellectual challenge and fun. – COMPLETELY FREE: Play all the way to the end with no in-app purchases required! – LEARN AT YOUR PACE: Tutorials for players of any ability level. – COMPARE AND COMPETE: Your game score, Game Center achievements and leaderboards will show who’s the most logical of your friends. Surely it’s you? – FEEL FREE TO MAKE MISTAKES: Any logic errors can be corrected with unlimited undo’s. 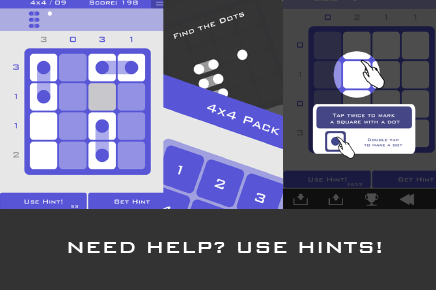 – HINTS IF YOU NEED THEM: If you get stuck, tap on the hint button and you’ll be puzzling again in no time! Your amazing support and positive feedback is always much appreciated. Have fun!